Attempting to set a Guinness World Record, one Dubai school had four failed attempts while trying to make the world's largest picture mosaic formed by people, due to the heavy winds in the emirate on Sunday. Even though the crowd was blown away by how 5,400 youngsters at The Kindergarten Starters came together to form a picture mosaic of the late UAE founder Sheikh Zayed bin Sultan Al Nahyan, the students couldn't hold on to their boards because of the strong gusts. Some also held their boards upside down, breaking the pattern of the mosaic. 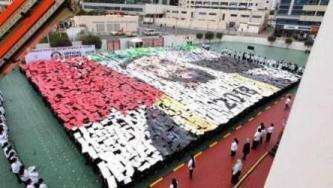 The record attempt was in honour of the Year of Zayed. "The requirement from Guinness was that it had to replicated 100 per cent correctly. They gave us four attempts, but since the students are young, I don't think they could've sustained it. The little ones also couldn't hold on to their cards due to the winds," Asha Alexander, Principal of The Kindergarten Starters, told Khaleej Times. The children and staff had rehearsed for six days to prepare for the attempt, she noted. Currently, Jeddah in Saudia Arabia holds the world record for the largest picture mosaic formed by humans, by 4,500 participants. Alexander, however, remained optimistic and said it's a "good thing" for students if they experience failure early on, as it teaches them to prepare better in the future. "You've got to take the chance and attempt it, because without trying you don't know what you're capable of," she said. "Hopefully, they knew what they were attempting wasn't easy. The Guinness World Record officials cannot dilute their standards out of sympathy for the number of children. We thought we'd give it a shot." When asked if the school will try the record-breaking attempt again, Alexander said "not immediately".